The whole domain of search engine and people's natural instinct to search is all together a fascinating world. People who have access to the internet, search engines touch and influence them to a degree we often don't realize. As the size of internet grows enormously every day, the role of search engine is only becoming larger and it will continue to be so. (How big is the internet you may ask? 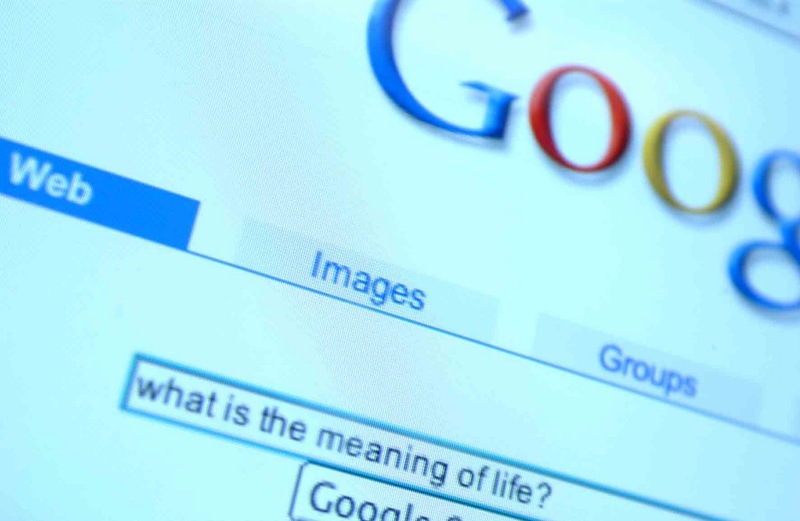 In 2008 Google has indexed some 1 trillion unique URLs online and the growth of the internet is more than 21% each year, now there is an estimate of 1.97 billion Internet users worldwide as of June 2010 data). Because of the nature of the internet and massive volume of contents available, it is often typing into a search engine is what get to people to they are looking for. From the perspective of spiritual seeking, the model of internet, the role of search engine and how people use internet to seek information is indeed a very interesting and evolving subject. Recently I have been working on a vision and a model regarding a framework that reflects and captures the priorities and necessities of the contemporary time when it comes to the seekers. The term seeker or seekers perhaps can be defined in a number of ways and may have many interpretations - but I am reminded of the wisdom teaching of Christ, "Seek you the Kingdom first, everything else will be given to you." 'Kingdom' here is the sacred knowledge of God, the wholesome actions that issue from the knowledge of unity of God and unity of creation. The call of action of "Seeking the Kingdom" implies awakening to the true reality which is here and in the hereafter. The one who truly seeks the Kingdom, is eventually led to the King and even though everyone has an unique path to reach that Neverland, every age has its own way of traveling, has appropriate vehicles that make the journey possible. "A Sufi is Son of the Moment." Below is a preliminary sketch (shown as an infograph) of the model where there are three cross-roads of priority of our time meets. The model is more or less self-explanatory but may have many layers of interpretations or expansions. I will explain the model more details in an upcoming post, but in this particular post I wish to touch only on the Connectivity component (encompassing the entire web, social media platform) of the model and how and why its important.. The reason why connectivity or participation in the web is going to play a vital role in the work of a modern day seeker can be understood well if we dig deep into the pattern of people's searching online in the realm of faith, religion and spirituality. While writing or sharing on various themes which I find inspiring, it was important for me that those subjects be found when people are looking for them. For this reason I began to study the search engine and their mechanism. As time progressed and I looked into how people are finding a particular posts, I was amazed by the number in which people turn to search engines to look for information that has to do with faith, religion and spirituality. Its not a news that people search for all kind of things online. And search engine being so efficient, often time the first thing people do is than they "google" it up. Now searching on subjects like faith, religion and spirituality has a whole different implications than just searching for photo of a rock star or where the nearest Apple store is. In an increasingly global world where we as human beings are at a point when with the right access we can know and learn about any other culture, faith tradition or religion. This breaks down a lot of walls, lot of barriers, specially walls of ignorance if people are finding the right information, motivated by the right kind of seeking. Since by nature we are living in more individualistic lifestyle, people tend to spend more time online and this is a growing phenomena whether we like it or not. This is particularly true in western world where internet users are a very large percentage of the population already. Global search of the word, "God" - 24.9 million a month, "Allah" - 2.74 million. 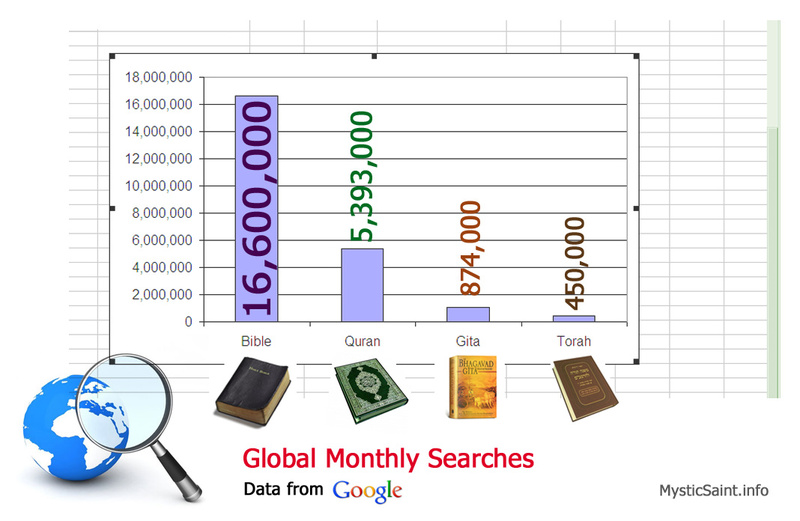 People search for, "God where" about 673,000 times, "Love God" is searched for 301,000 times a month globally. People put into the search engine, "God is" as a search string about 1,500,000 times every month. "Talk to God", "God help me", "help me God" are searched in total about 66,000 every month around the world. People are even asks question such as, "god where are you?" (673,000), "what god are you?" (33,100), "who is god?" (90,500), "is there a god" (90,500), "does god exist" (27,100) or "how to know god?" (18,100). Among other interesting searches that came to my attention which happen in quite significant volume are mentioned below (all values are Global searches per month). zen 5,000,000; "kundalini yoga" 135,000; "tai chi " 1,220,000; saint 30,400,000. Believe it or not, people even search for, "how to love" 1220000. They are even curious about other people's definition about "what is love" which is searched in the order of about 1,000,000 every month. "true love" 823,000; "meaning of love" 165,000; "definition of love" 135,000; "love definition" 135,000; "god is love" 301,000. These are just snippets of huge amount of search that goes online related to the matter of faith, religion and spirituality or perennial issues of human existence. The phenomena of people's searching online for subjects such as faith, religion and spirituality - mind you that these subjects are very powerful and can alter a person more than any other subjects. From that perspective, the role of internet in connecting, informing or sharing on issues of faith and spirituality is massively important. Fortunately or unfortunately in the present world the value of organized religion has altered forever. In the west the church has lost its value compared to where it was fifty or hundreds of years ago. In the east the influence of west is every catching up. What does it mean when it comes to the younger generation, the generations to comes? We already have data suggesting that people who are moving away from orthodox format of religions, or its formal institutions, they are no longer reaching out to a traditional spokesperson or a representative of a church or mosque. Instead they are turning in an ever increasing number to internet and to be precise, to search engines. Social networking sites are also playing a large role in connecting very diverse group of spiritual seekers into the same platform, they are exchanging and learning about each others faith and tradition at a scale completely impossible before. Searching information related to faith, religion and spirituality over the internet offers a number of advantage. Its quite private, personal and convenient. At the same time this also exposes the person to much wider spectrum of information. Of course there are rubbish, there are misinformation online on any subject, but I am not intending to focus on the dark side because the pattern and its potential is far too great and so inescapable that its not productive be fearful about its misuse alone. What I am more interested is how do we interpret this data, this trend of people's natural instinct to search online for perrenial issues and how do we put it to best interest of humanity. In what way can we embrace this gift of a medium that offers humanity to come together? In what way, internet is going to play a key role as a successor of messengers and how human beings who understand this gift tap into it? The pace of change in the world is faster than the rate of change that traditional models, how orthodoxy react to people and their need. 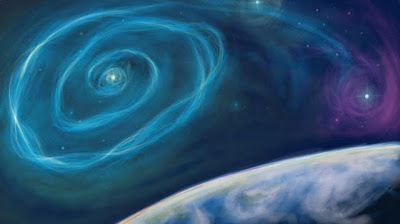 Connectivity / web is going to be the single most accessed space where people will turn to get information, be it spiritual or otherwise. Internet is already a metaphysical reality of oneness made manifest for real. There is an interesting phenomenon that happens when we learn about diverse facets of truth. What happens when we learn about another faith, read inspirations which are universal and true? What happens when we start to learn about the same truth spoken by various messenger of different paths? Doesn't our heart get instantly touched by the beauty and truth even if it is sung through a song of an unknown language? What if the world start to awaken to the realization that there is no fundamental distinction between any of the Divine Message and the Messengers? What if we start to recognize the inherent truth in every religion and every path? Then a silent revolution starts to happen within not just one, or few but many. A mind which is expanded, a heart which is opened, can not go back to its previous inspaciousness. As Oliver Wendell Holmes said, "The mind, once expanded to the dimensions of larger ideas, never returns to its original size." Someone who once taste the truth and its overwhelming beauty can never be satisfied with petty narrow mindedness. In the realm of faith, religion and spirituality this has very hopeful opportunity that Internet, web, connectivity will make unity a much more real and imminent possibility. An agnostic Christian in Alaska can now very easily search and find a copy of Bhagavad Gita and learn about Hinduism and its sublime mode of realizations. A Buddhist Monk in Mongolia can quench his curiosity about the teachings of Jesus just through the internet. A Muslim can learn about Zen way of meditating and practice mindfulness even in his or her own practice in a better way. A Christian woman who never in her life have met a Muslim, let alone a Sufi can immerse herself in the beautiful poetry of Rumi over the internet without much hardship. This has a silent but revolutionary effect on human consciousness in a collective and mass scale. We are awaiting for a critical mass, a critical threshold portion of humanity to listen to that one song. There is a vision that is given to contemporary mystics, a vision of unity. A vision of unity of humanity that beholds that a day is coming when we will consider the teachings of all great masters, all great spiritual teachers of humanity as common heritage of humanity. A day is coming when we will come to realize without any need of debate or argument that Ram and Rahim, Alaha, Allah and Yahweh, Sunnyata and Tao all points to the One Incomparable Reality. No distinctions will be made between any of the messengers. Human beings will learn to embrace the wisdom teachings of Buddha as precious jewels, they will learn to realize non-duality teachings of ancient India through Vedanta, they will revere the Hebrew sages as those human beings who had deep awe of a God, they will recognize and live the universal teachings of Christ of loving the other as one's own, they will find that doors are still open to enter into deep ecstatic states through way of the Sufi masters, they will understand the wisdom of Islam and its guidance of deep surrender and unity, they will recognize that in the sight of God, true religion, true devotion means sincere loving surrender and acting with compassion to fellow human beings, to all sentient beings. "You shall know the truth and truth will make you free." There is a sufi term called, Warith ar-Rasul or Successor or Heir of Messenger. In classical sufism, the illuminated guides of Sufi Path are called Warith ar-Rasul or Heir of the Messenger because it is them who inherit the Message in their heart, preserve and transmit it in succession. There are many medium through which message is preserved and transmitted. If we take the example of the Last Revelation in the form of Quran. In the beginning it was preserved only in the memory and heart of early companions. Then it was written down in isolated forms, on animal skins, on papyrus etc. After that it was written down as a collection from which the Quran was preserved as a Book. That which carry the Message and act as a transmitter of that Message can be called the Successor. This is not to say that the archetypal and the purest method of transmission, which happens from one heart to another is going to be replaced, but that very methodology is going to be radically accelerated and supplemented by the role of the internet. In a sense, virtually the net is taking up the role of that successor because literally through seeking, many people are stumbling upon the Messages of Truth, Peace, Harmony and Unity. So a daring prediction is that the role of messengership is going to be transferred to the internet more and more. We can see the proof already because a staggering amount of people, when they have religious or spiritual queries, they don’t turn to a priest, imam, mullah or town padri but to the internet. This is already so common and only going to be far more common place, no matter how strange the idea may sound to our mind living in 2011. Here is another progression or evolution in the methodology of spiritual seeking which we are undergoing. In the ancient past, there were few enlightened teachers, far and wide (less in quantity, but extremely high in quality, Sat-Guru in the highest degree), and seekers had to go through much arduous journey to find the teacher and his teachings. Just to listen to some instruction of wisdom and truth they had to travel hundreds of miles, sometime had to sacrifice much, had to wait many years. Fast forward few thousand years, there are moderate number of teachers (the number has increased, even though quality has decreased), all that is taught are nothing radically new, everything has already been transmitted, teacher’s role is just to transmit them, remind the teachings only. Now since life on planet has changed so radically, for sometime now, more and more spiritual teachers are traveling to their students, to seekers and making the seeking easier. The seekers are now being sought. Fast forward even more, perhaps by one hundred or two hundred years, those who give spiritual teachings are even more in number. May be if you count, you could find that there are as many meditation centers in a town (each having a so called spiritual teacher) now as there are barber shops. But notice something interesting. Everything that is said is nothing new at all. In fact logically they can not be anything new regarding the perennial issues of humanity. The Seal of Prophethood has been sealed already about 1500 years ago. The teachings and framework is already given. Even though the Prophethood has been seal (khatamun Nabi), the role of messengership continues. Message bearing is not sealed. What is unique though, is the method in which all these spiritual teachings that will be made available to anyone, anywhere, almost as if effortlessly. Here the internet / web playing an extremely important role in bringing in the spiritual information at the fingertips of the seekers. Compared to arduous journey to teachers in the past, then its the teachers who are coming to seekers, and finally in the further stage of spiritual method evolution even the teachings are coming to their desktop, handheld devices and fingertips. In this regard, the internet will be a virtual wraith ar-Rasul because it is through this media, knowledge and the principal of iqra (read, learn) is transmitted the most effective, efficient and expansive way. And by Rasul we don't discriminate to mean just one Rasul, but all the Rasul, all Divine Messengers and their Message. Wa Salamun alal Mursalin. Salutation of peace to all Divine Messengers. ".. that the Messenger may be a witness over you and you be witnesses over mankind." ** Contact Sweet Information Architecture for project inquiries about Information Architecture: the role of faith, culture and spreading ideas.